Hello. I wanted toask you about the change of the name of the address of my blog. I am not quite sure if this change affects the content of the blog (i just want to change the name) and if I can make it more than once. Thank you. 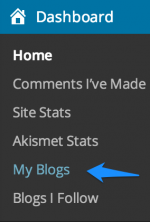 The blog I need help with is causaesma.wordpress.com. Hello. I wanted to ask you about the change of the name of the address of my blog. I am not quite sure if this change affects the content of the blog (I just want to change the name) and if I can make it more than once. Thank you. You waited for 2 whole minutes and I had already answered. Realistically speaking it can take 24 hours to get a first response to a support forum thread. Thank you. But this changes guarantees me that the content will remain the same? Can I change it more than once? 1. Do you want to just change a site title? If so then you can do that as many times as you wish to, just like I said above and no content will be impacted. 2. Do you want to change the .wordpress.com blog address ie. the URL starting with http://? Changing a URL is a permanent and irreversible act. No changed or deleted blog URLs are recycled here, regardless of who registered and deleted them and no exceptions are made. 3. Do you want to purchase your own domain URL and map to it from this .wordpress.com URL http://causaesma.wordpress.com/? Domain mapping of an existing domain URL that you already own and purchased elsewhere is not done free of charge. You will have to renew the domain name purchase where you made, it and the domain mapping purchase here, each and every year. Mapping an existing domain costs $13. annually and a domain name purchase and domain mapping are included in the Premium upgrade bundle. In order to map to a domain one must have an underlying .wordpress.com sub-domain blog to map from and it does not matter what that underlying .wordpress.com URL is. It does not have to match the domain URL. It can take between 24 – 72 hours for domain name propagation to take place throughout the internet. You can view the DNS changes here > http://www.whatsmydns.net/ What’s important during that stage is to be patient. P.S. I tagged this thread with modlook for a Staff follow-up. Please subscribe to it so you are notified when they respond. To subscribe look in the sidebar of this thread, find the subscribe to topics link and click it. What exactly do you want to change? Why would you want to change it more than once? The repetition of the question was not intentional. I published it by mistake. Sorry. The topic ‘Change of address name’ is closed to new replies.